In today’s fast-paced business world, where the lines between home and work are blurring, and where communicating across physical boundaries is business-critical, you need technology that grants employees the freedom to collaborate with customers and each other, wherever they are. IP networking have to offer to create a world-leading system for digital communication. From office and corridor to ward, basement or warehouse floor, Digital Enhanced Cordless Communications (DECT) enables mobile telephony, without compromising on voice quality. But Panasonic’s DECT technology offers you more. Our Multi-Cell DECT solutions provide installed radio cell stations within your building. These stations deliver overlapping ‘cells’ of coverage. Meaning that as you move from one area to another, connections are automatically transferred between cells. Such a seamless handover gives you true multi-zone communication. You can move freely around your building while making a call, without having to worry about interrupted connections. Multi-Cell DECT uses a different frequency to WiFi and Bluetooth, so it can be operated in parallel without disruption. We also offer our UC Pro business application, which supports PCs, smartphones and tablets, for truly flexible multi-zone, multi-device communication. 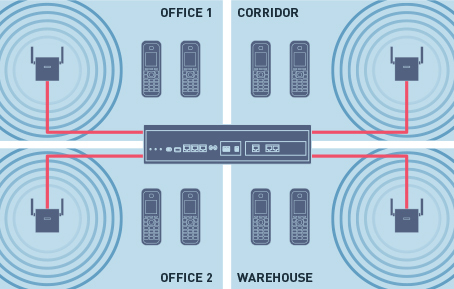 The range of cells within your building can easily be expanded according to your business and communication needs, even if you don’t have a Local Area Network (LAN). Communication freedom doesn’t have to be limited to your building. Our IP cell stations allow you to connect your Private Branch Exchange (PBX) via your LAN. There’s no need to install a further PBX at your branch office or buildings, just a simple and cost-effective IP cell station. Panasonic handsets support Bluetooth®, so are the perfect solution for factory, healthcare and retail environments that require the use of hands-free communication. Mobile, wireless-based work is often carried out in fast-paced, damp or dusty conditions. But Panasonic’s KX-TCA385 telephone handset is IP65-rated for water and dust resistance. Our PBX systems mean that calls made between your employees are free, even between branches, irrespective of where they’re located. Outside lines are shared, saving further costs, and thanks to typical inbuilt call features such as call transfer and ID, you won’t be tied to central office or switchboard operator fees. And with LAN synchronisation, Panasonic’s wireless systems can be configured more efficiently to cover a wider range at a lower cost. Setup is simple, saving engineering time and expense. Thanks to Panasonic’s DECT paging function, important information can instantly be shared with staff, no matter your company size, for faster response times. There’s no need to actually handle a phone, and users can both respond to announcements and hear colleague replies.